Counting birds during the Christmas period has been a tradition of naturalists and bird watchers across the continent since 1900. This year almost 2000 Christmas Birds Counts will be held. Each count now follows a standardized procedure so the results are comparable. Each individual count covers an area contained within a circle with diameter of 24 kilometers and conducted during one calendar day. 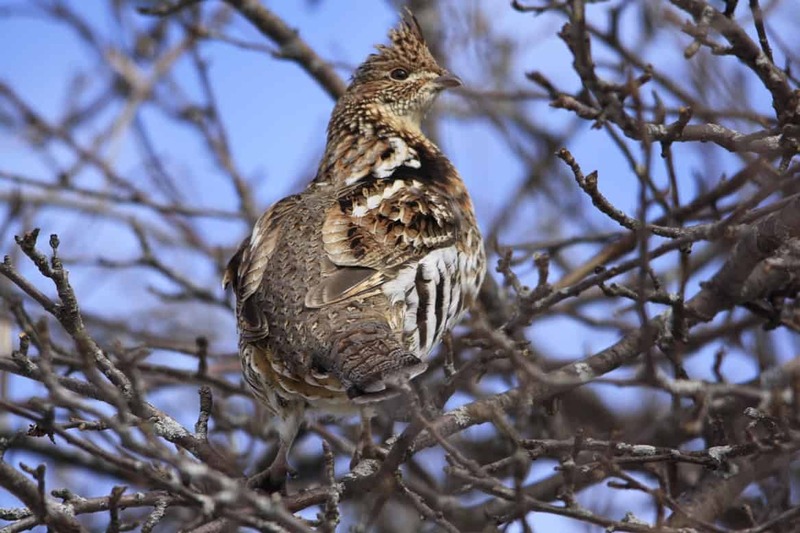 Christmas bird counts are conducted between December 14 and January 5 annually. Christmas Bird Counts have been coordinated by the National Audubon Society since the original counts were held in 1900. One of the original counts was held in Toronto, Ontario and has been held annually since. In Canada the counts are now coordinated by Bird Studies Canada who provide support to count compilers and summarizes the results. Collectively the counts provide an insight into the status of our wintering birds across the continent and ongoing trends. 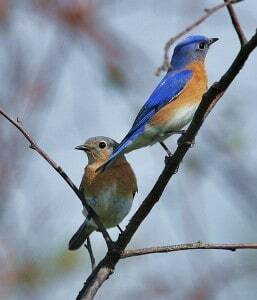 The exact numbers of birds observed on individual counts are less important than the trend for the species over a wide area. 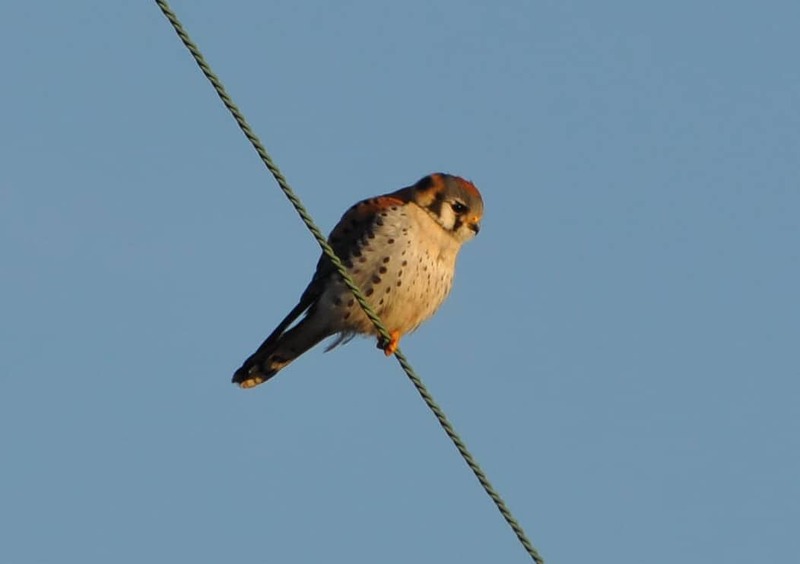 In the Peterborough area over the years there have been a number of significant changes in populations of some birds. The Northern Cardinal, which is a common visitor to feeders throughout Peterborough, was not found on any counts held in the 1950’s and on only one count in the 1960’s. Now it is a common year-round resident. An average of 83 individuals have been recorded on the Peterborough count over the past ten years. 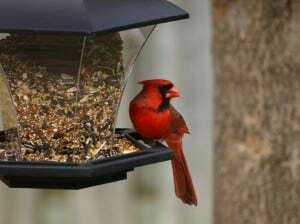 This year there were 108 Northern Cardinals. Finches. The number of House Finches is lower than the numbers recorded when they initially arrived in the Peterborough region. The introduction of Canada Geese into southern Ontario resulted in a development of a non-migratory population of this species in the region. 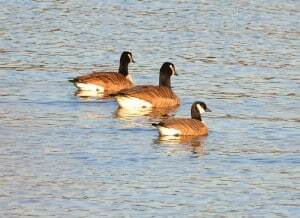 These geese do not migrate to southern destinations, rather move between water areas in the Great Lakes basin. They are now present on the annual Christmas Bird Counts. A total of 640 were recorded this year. Wild Turkeys are another species which have been re-introduced to the region in recent years and their numbers are increasing annually. A record number of 306 were found on count day. 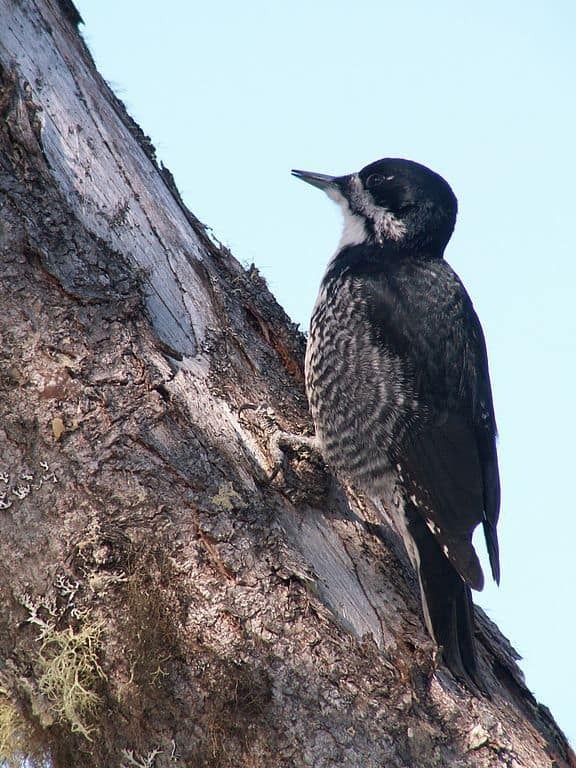 In the late 1950’s and 1960’s both Black-backed and American Three-toed Woodpeckers were found in small numbers on the annual Christmas Bird Counts. They have been absent in recent years. In the late 1950’a and 1960’s the Dutch Elm Disease was killing the elms in the region resulting in the presence of lots of bark beetles under the bark of dyeing elms. These northern woodpeckers moved south annually to feast on this new food source. This year the 62nd Peterborough Christmas Bird Count was conducted by forty-five volunteers under the sponsorship of the Peterborough Field Naturalists and coordinated by Tony Bigg, on Sunday December 14. The count circle was dived into ten smaller areas and a field party consisting of both experienced and beginning counters were assigned to cover each area. During the day the participants walked the trails and roadways in the area for birds such as Black-capped Chickadee and Blue Jay, scanned the open waters of the Otonabee River and Little Lake for geese, ducks and gull species, checked the open fields for Wild Turkeys and Red-tailed Hawks, and checked known feeders for Northern Cardinals, Dark-eyed Juncos and other birds. According to Tony Bigg, count compiler, “the results this year are surprising. In spite of the cold weather in a few weeks ago there was a record number of species on the Peterborough Count this year. Also a record number of participants’. Some of the area groups split into multiple field parties permitting more habitats to be checked. Some of the participants were out in the field well before dawn in an attempt to hear and locate some of the nocturnal owls, species which are very difficult to find in the day-light hours. Field activities ended at dusk when the participants gathered at a restaurant to celebrate the unusual finds of the day and to compile the results for the day’s effort. Tony Bigg called out the individual species and each field party in turn reported the number of individuals they observed. 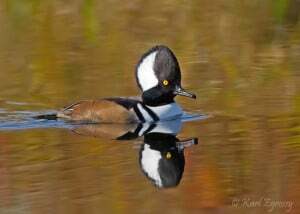 Some species were only observed by one group and other species such as Blue Jays, and Black-capped Chickadees were reported by all the groups. At the end of the compiling a total of 66 species of birds were reported, a new high for the Peterborough Christmas Bird Count. A total of 11,773 individual birds were observed according to the preliminary summary circulated by Bigg. A few feeder watcher results have yet to be received. 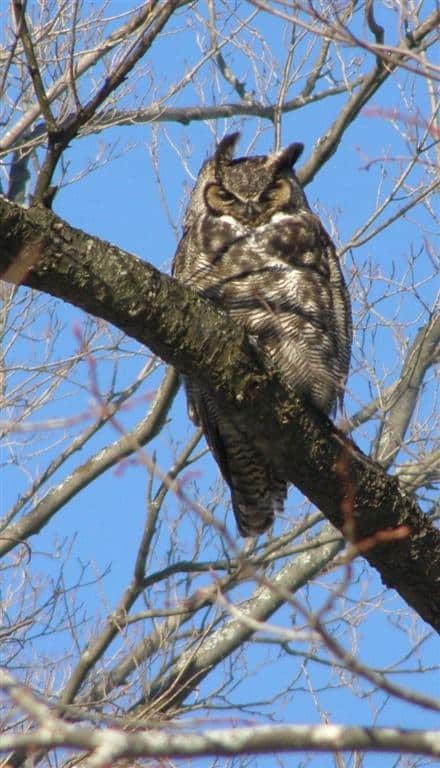 The oldest Christmas Bird Count for Peterborough, according to the records of the Peterborough Field Naturalists, was held on Saturday, December 25, 1953. Although the report in the Club’s newsletter indicated there were earlier counts. At this time information on these counts are not available. On the 1953 count the participants did not start until 8:45 am. and completed the day’s birding around noon. There were 20 participants who formed five field parties. They observed a total of 21 species of birds on that count. On that count the participant found a Killdeer, a summer bird of the region which is not expected to be present in the winter months. It has not been recorded on any count since the 1953 count. There were special and unusual species found by the count participants on this year’s count. Finding a bird which is unexpected is always a thrill for the person finding it. 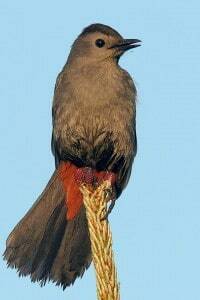 The participants identified a total of 67 species of birds, which exceeds the previous high of 62. A grand total of 11,774 individual birds were recorded. This was not a record. A single Pied-billed Grebe was found on the Otonabee River between Trent and Lakefield. This summer bird is occasionally found on the Peterborough CBC. A total of 2 Great Blue Herons were also found. A total of seven species of geese and ducks were recorded. 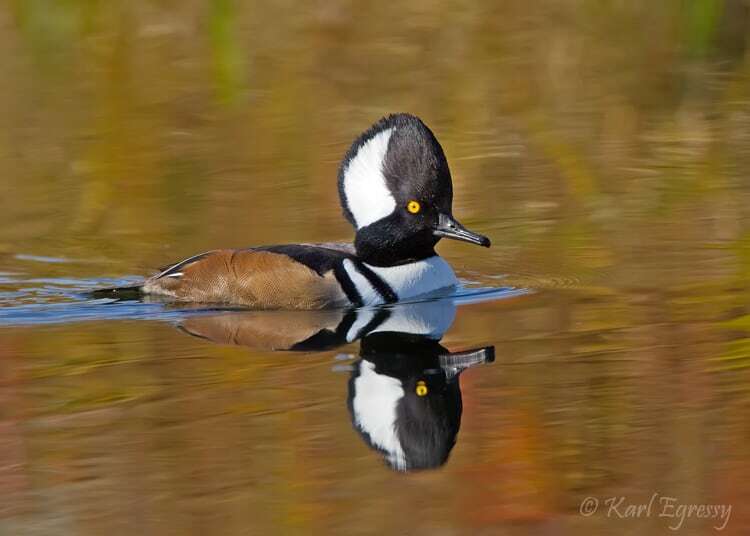 They consisted of 540 Canada Geese, 4 American Black Ducks, 903 Mallards, 18 Common Goldeneyes, 1Bufflehead, 6 Hooded Mergansers, and 24 Common Mergansers, the majority on the Otonabee River. 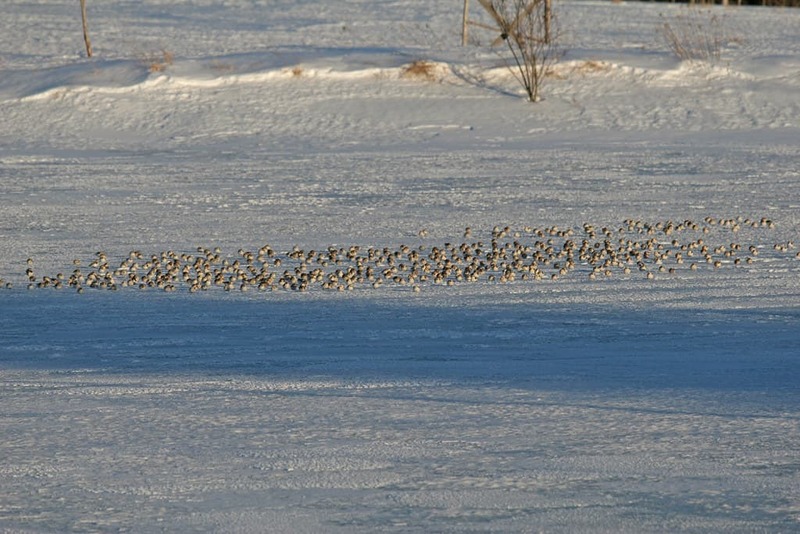 The cold periods prior to the count resulted in some of the birds moving to areas with more open water. Raptors or hawks were well represented. 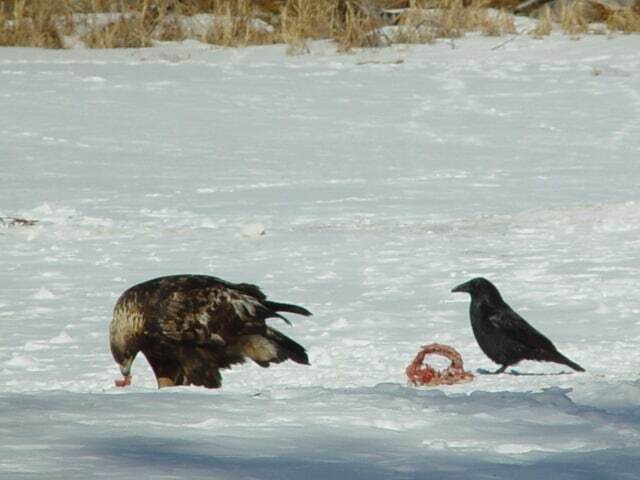 The 2 Bald Eagles recorded ties the previous high. 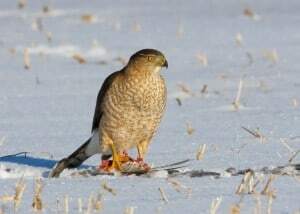 The five Sharp-shinned Hawks, 6 Cooper’s Hawks, equal the previous high counts and the 64 Red-tailed Hawks surpass the previous high of 62. One Rough-legged Hawk and 6 American Kestrels were located. 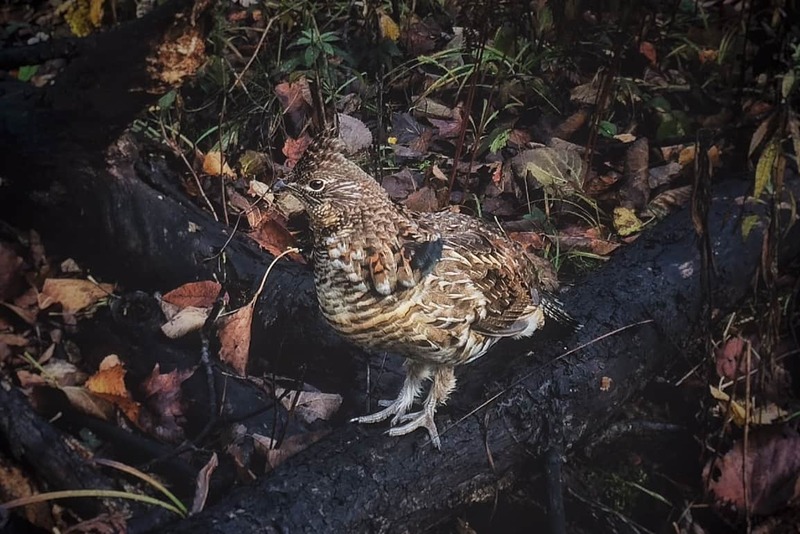 The 12 Ruffed Grouse is above the average of 7 over the previous counts. As noted the 306 Wild Turkeys epresent a new high as this species becomes more abundant annually. On the Otonabee River a single American Coot was found, as species which in the past has been found occasionally on count day. An average number of gulls were seen on count day and include 93 Ring-billed, 413 Herring, 2 Glaucous, and 3 Great Black-backed Gulls. Rock Pigeons are doing well with a total of 1705 individuals being found. A total of 938 Mourning Doves were spotted well above the ten year average of 644. 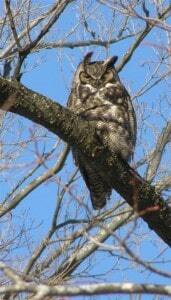 Four species of owls were located, including 1 Eastern Screech, 6 Great Horned, 1 Snowy, and 2 Barred Owls. The 2 Barred Owls is a new count high. 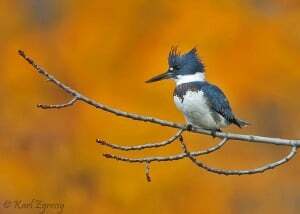 A single Belted Kingfisher was found. Woodpeckers located were 7 Red-bellied (a new high), 61 Downy, 62 Hairy, 6 Pileated which ties the previous high and the 2 Northern Flickers, a species which should be to he south. The 363 Blue Jays is above the ten year average of 282. The 578 American Crows is above average and the 24 Northern Ravens is a new high count. The finding of 2 Horned Larks was a surprise. A total of 1752 Black-capped Chickadees and 8 Red-breasted Nuthatches were found along with a record number of 116 White-breasted Nuthatches. Only one secretive Brown Creeper and 6 Golden-crowned Kinglets were spotted. A single Ruby-crowned Kinglet, single Hermit Thrush and single Gray Catbird were a surprises. This was the first time in 62 years that a Gray Catbird was located. It was found by the Dave Milsom and Iain Rayner party in the Television Road area the City. 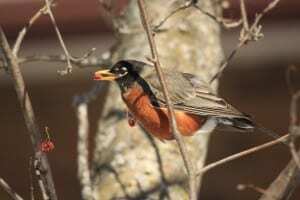 Only 25 American Robins were found, well below the ten year average of 202. Lack of wild berries is a factor. Another bird which should have long departed was a Yellow-rumped Warbler which has been coming to the feeder of Bob and Maxime Prentice for a couple of weeks. 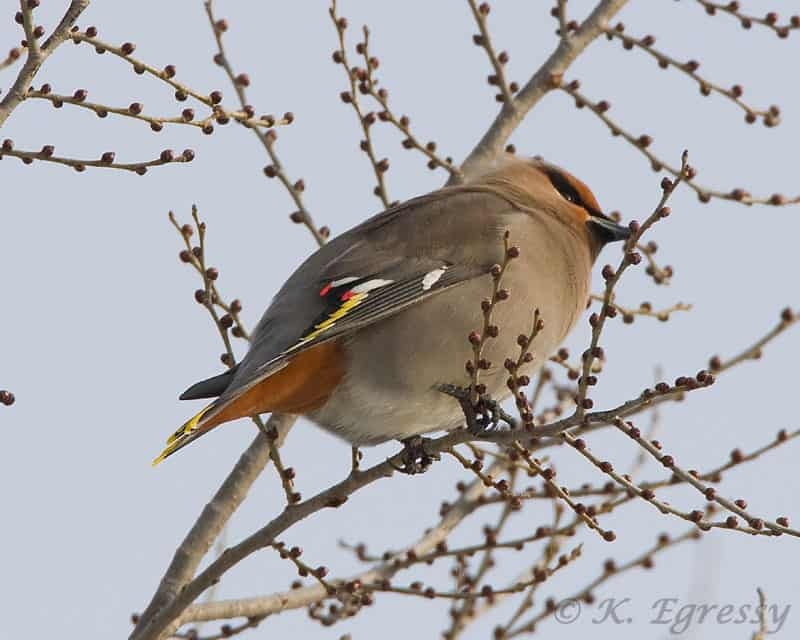 A single Bohemian Waxwing was foiund in a flock of Cedar Waxwings in the Bridgenorth area. 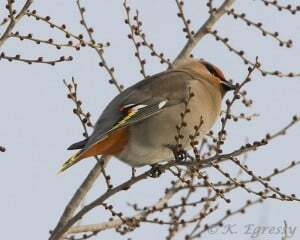 A total of 283 Cedar Waxwings were spotted, above the ten year average of 173. 1095 European Starlings were recorded. The 108 Northern Cardinals is above the average of 83. Sparrow highlights include a single Song Sparrow and 10 White-throated Sparrow. Most of the White-throated Sparrows were associated with feders. Other sparrows include 302 American Tree Sparrow, and record high of 510 Dark-eyed Junco. 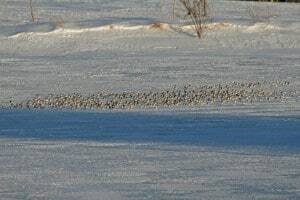 Two parties found flocks of Snow Bunting comprising 213 individuals. The Luke Berg and Tony Bigg party in the Bridgenorth area found the only Common Grackles (3) and Red-winged Blackbird (1) in a flock of starlings. A total of six species of winter finches were recorded: 3 Purple Finch, 74 House Finch, 250 Common Redpolls, 9 Pine Siskin, 532 American Goldfinch and 4 Evening Grosbeak. These species are highly erratic and vary tremendously in numbers from one winter to another. 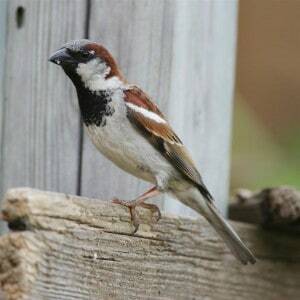 The final species was House Sparrow with a total of 259 individuals. The 2014 Peterborough Count is a memorable count with above freezing tempratues, some light drizzle and a record number of participants and species of birds being located. 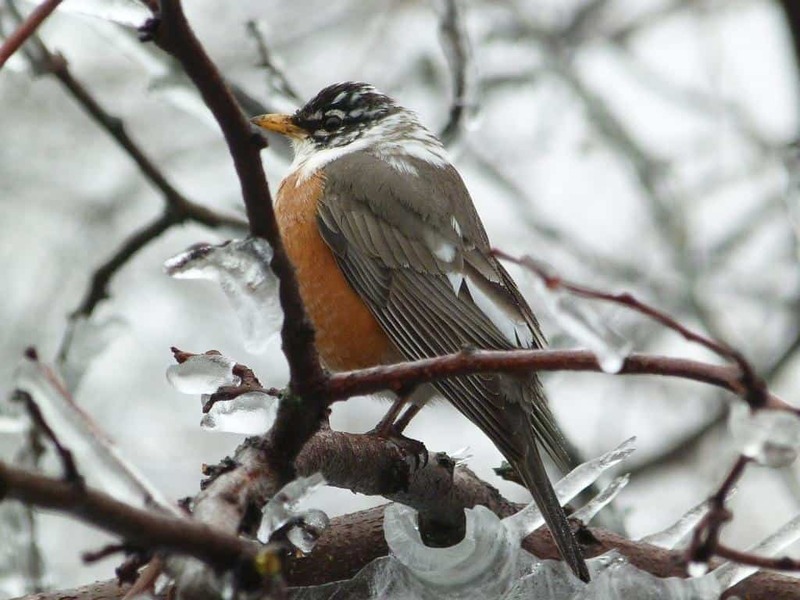 The participants are citizen scientiests collectively providing valuable data, which when combined with the results from other Christmas Bird Counts provide valuable data on understanding the status of the wintering birds in North America. 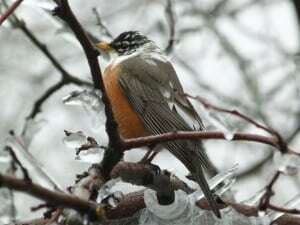 The Peterborough Christmas Bird Count is just one of two counts being held this year in Peterborough County. On December 27 the 29th Petroglyphs Christmas Bird Count will be held. This count is centered on Petroglyphs Provincial Park and extends northward to the Apsley area. The compiler for this count is Colin Jones. Other counts are held in the Port Hope-Cobourg area, the Rice Lake Plain in the Alderville area, Lindsay and the Fenelon Falls area. Some of the participants in the Peterborough Count will also be participating in other Christmas Birds Counts. Peterborough Christmas Bird Count: A record year! 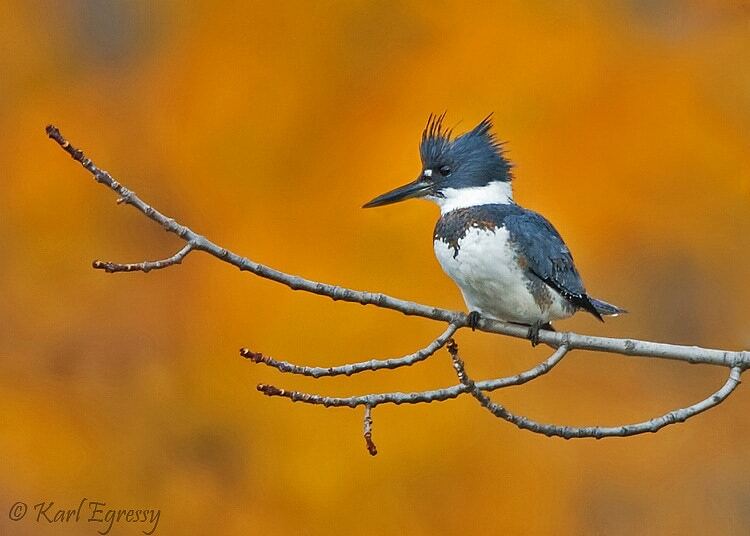 The 63rd annual Peterborough Christmas Bird Count was held on Sunday, December 14. It was a relatively mild day (-1 to +1 deg C) Here are some of the highlights. Of note were four Evening Grosbeaks (1st since 1999, the large increase in the number of Common Ravens (5 to 24, a trend that appears to be happening in other counts), rare occurrences of Bufflehead, Rough-legged Hawk (1st since 2006), American Coot (1st since 2003), Horned Lark(1st since 2005), Ruby-crowned Kinglet (1st seen two years ago), only one Bohemian Waxwing (on our counts they are almost regular every other year, this should be a big year), Yellow-rumped Warbler, since once in 1981, and now three times in the last 4 years), Common Grackle (1st since 2006). Regulars, past participants, newcomers to the area, and newcomers to birding, all are welcome to participate in this long-standing annual winter bird census. They will be partnered with more experienced local birders. More eyes result in more birds seen! Be prepared for a long day and possibly cold weather. The count is an all-day affair, starting at daylight, or preferably earlier if you wish to add owls to the day’s list, and finishing in time to make the compilation. The compilation of species seen will be made at the Ashburnham Ale House in the East City on Hunter Street at 5:00 pm. There is no longer a fee for entry, but allow for the cost of a meal of your choice at the compilation. The count area consists of a circle of 15 mile (24km) diameter which is divided into 10 separate sections to which groups will be allocated. Group leaders may wish to sub-divide their areas to get better coverage. Prospective participants should let me know as soon as possible if they are available for this count. There is always a lot to be done in organizing the groups so please do not leave your reply until the last moment unless absolutely necessary. If previous participants wish to have certain areas, and join with certain other participants please note this in your replies. Our average number of participants for the last 10 counts has been over 30 people. Between mid-December and early January, birders from across North, Central and South America take a break from the holiday season excess to spend a day in the fresh air, identifying and counting birds. 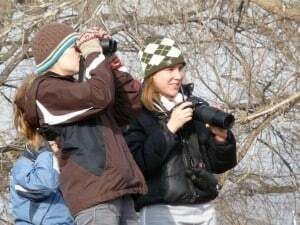 Dating all the way back to 1900, Christmas bird counts represent the biggest organized birding event in the world and a holiday tradition for over 50,000 birders each year. They first began from a desire to count birds rather than shoot them. In doing so, they effectively gave birth to North America’s modern conservation movement. The 62nd Peterborough Christmas Bird Count was held December 15th in temperatures of -15 to -10 C. All areas of still water were frozen. The 35 participants found 51 bird species which is slightly below the ten year count average of 54. The 10189 individual birds recorded was about average for the count. One new species for the count was discovered, namely a Red-necked Grebe found on the Otonabee River between Beavermead Park and the Little Lake Cemetery. 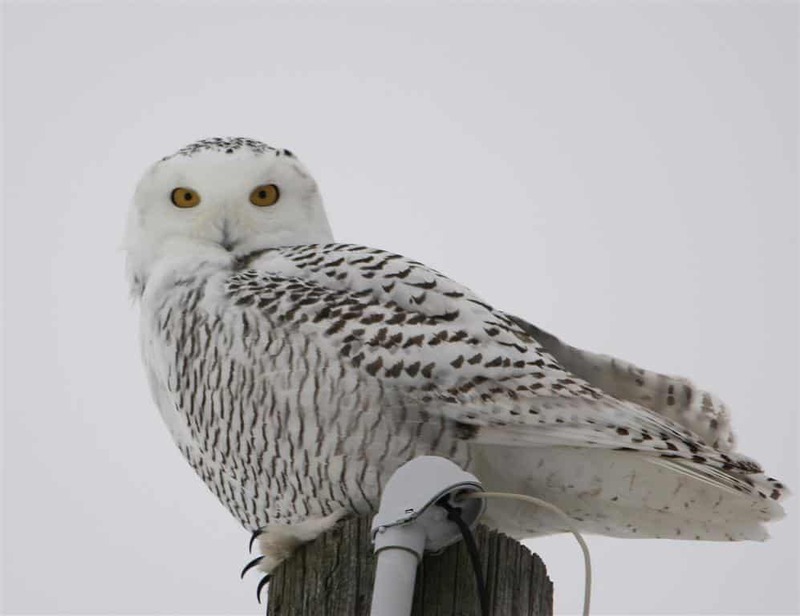 Some other notable birds included a Short-eared Owl, a Snowy Owl, 5 Bufflehead ducks (last seen 2004) and three Long-tailed Ducks. The only other time this Arctic-nesting duck turned up on the count was in 1996. As for numbers of birds, record highs were tallied for Bald Eagles (4), Cooper’s Hawks (10), Red-bellied Woodpeckers (8), Common Raven (10) and Dark-eyed Juncos (453). Snowy Owl (1), Short-eared Owl (1), Belted Kingfisher (3) and Pileated Wood pecker (14) equaled previous records. As is the case every year, there were also notable misses. Observers failed to find any American Black Ducks, Sharp-shinned Hawks or Great Black-backed Gulls. The most remarkable low number belongs to the once-abundant House Sparrow. Only 39 were recorded, which is the lowest number since the count began. House Sparrows appear to be declining in Ontario, possibly as a result of changes in farming and building practices as well as increased numbers of bird-eating hawks in urban areas. Finch species that were common on last year’s count such as Pine Siskins and Common Redpolls were completely absent this year, having elected to remain in northern Canada where seed crops are abundant. 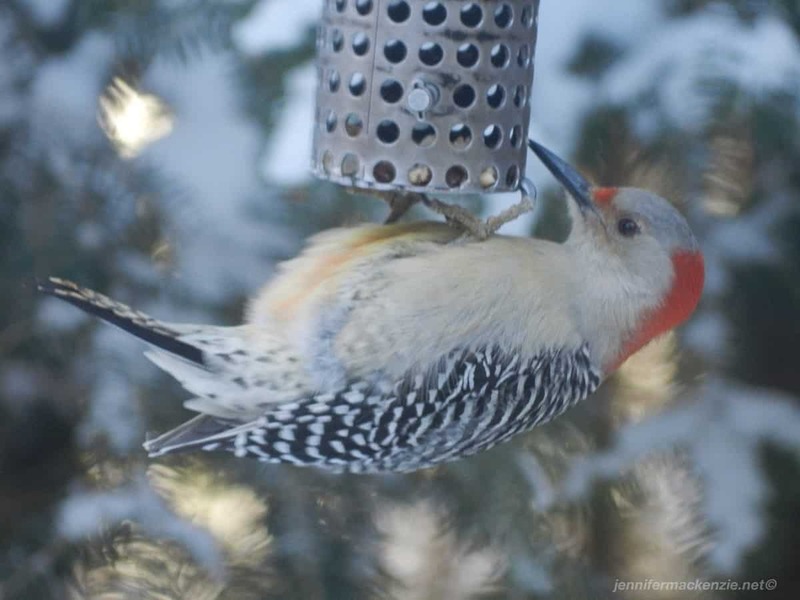 When these birds move southward in late fall and winter and turn up at our feeders, it is usually because of a lack of wild food in their northern breeding range. The 28th Petroglyph count took place on January 2nd. The 30 participants braved frigid -27 C temperatures in the early morning as well as strong winds that lasted all day. There is little doubt that these difficult conditions contributed to the relatively low number of individual birds recorded (2165). Even Black-capped Chickadees were largely unresponsive to the pishing, squeaking and owl call imitations that usually bring them in close to observers. Despite the weather, species of note were still recorded. Among these were two spectacular Golden Eagles that were seen feeding on Beaver carcasses that a local trapper had put out. Also of special interest were three American Robins – only the fifth time robins have been found on the count – and a Black-backed Woodpecker. 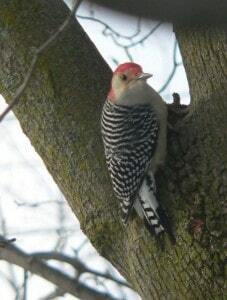 Observers stumbled upon this handsome but uncommon woodpecker at Petroglyphs Provincial Park. As for high numbers, a record 126 Wild Turkeys turned up, virtually all of which were at feeders. The 564 Blue Jays recorded was close to the record high of 653. Large numbers of jays took a pass on migrating south this past fall, electing simply to stay put and to take advantage of central Ontario’s abundant crop of acorns and beech nuts to get them through the winter. Above average numbers of Dark-eyed Juncos and American Tree Sparrows were also noted. For the fourth year in a row, no Gray Jays were found. 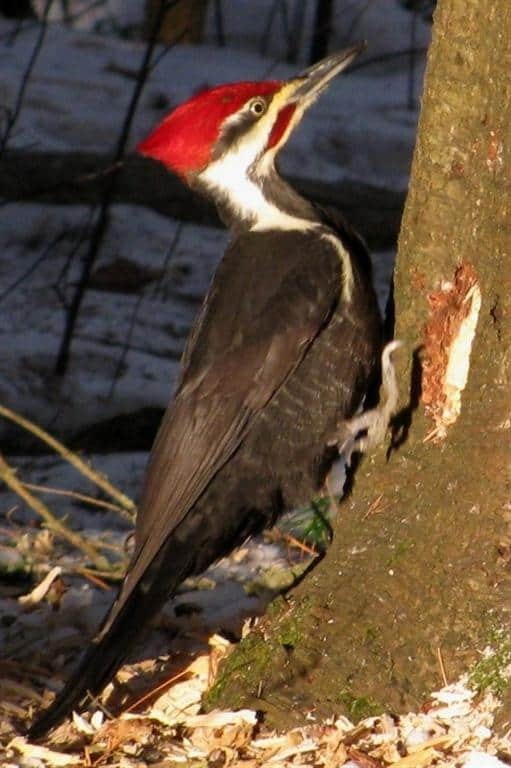 Although single birds have been recorded in both Petroglyphs Provincial Park and the Kawartha Nordic Ski Trails earlier this fall and winter, no family groups have been noted for several years. Prior to 2010, the average count for Gray Jays was 5, and they were recorded every year with the exception of 1990. Gray Jays are one of many species that are expected to decrease in number as the climate warms, especially at the southern edge of their range such as here in the Kawarthas. Low numbers was the order of the day for Ruffed Grouse. Only nine grouse were recorded which is below the 10-year average of 19 and well below the record high of 77. 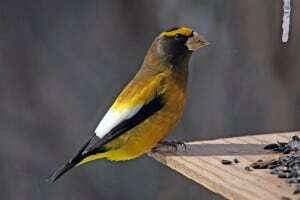 As in the Peterborough count, finch diversity was also poor with only three species tallied, namely Red Crossbill, American Goldfinch and Evening Grosbeak.